In 1856, the first railroad bridge crossed the Mississippi River at Rock Island, Illinois. One hundred years later, British skiffle musician Lonnie Donegan had a top hit with “Rock Island Line,” first popularized by Lead Belly. Sixty years after that, Bill Bragg and Joe Henry boarded Amtrak’s Texas Eagle line in Chicago, and as the pair traveled the next four days over the rails to Los Angeles, they recorded their own version of “Rock Island Line” and 12 other classic train songs. The resulting album, Shine A Light: Field Recordings From The Great American Railroad, is a bold and fascinating project that examines one particularly enduring subject in the history of American music. 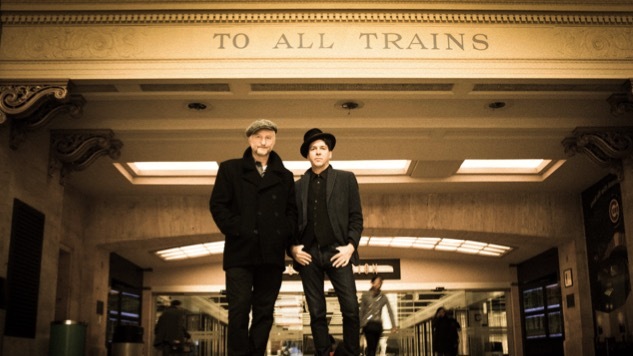 To accompany the album, the duo put together a website for the project, with photos, video clips and railroad history from each stop along the route. Nobody, Bragg says, sings about a lonesome car horn honking. Or writes legends of the great highway pavers. But railroads have captured the imagination of songwriters in a way that speaks to the unlimited potential in travel. And in a very practical sense, railroads played a huge role in spreading American musical styles around the country. A longtime student of American history and folk music, Bragg first conceived what would become Shine A Light while researching how the guitar came to the forefront of British music. Skiffle players in the 1950s adopted as their repertoire the songs of Lead Belly, Woody Guthrie and others. The key figure was Lonnie Donegan, the most influential British artist before The Beatles. Bragg’s fascination with this bedrock subject of American music deepened and turned to Henry, who produced Bragg’s 2013 record Tooth & Nail. Friends since the 1980s, they’d been considering a collaboration for years, and after Tooth & Nail, the door was wide open. “Even though this is all music I’ve grown up with and have always loved, Billy brought a very unique perspective to it, wanting to look at it not only from the a historical perspective, but the ways in which that history is still alive for us,” Henry says. The pair traded songs back and forth in email and phone conversations for months, getting together at Henry’s house in Los Angeles for just two days before departing for Chicago. Crossing America on the Texas Eagle and Sunset Limited lines, they logged 2,728 miles of rail, recording as they passed through St. Louis, Fort Worth, San Antonio, El Paso and Tucson before returning to Los Angeles. Bragg and Henry found it easy to surrender to the demands of their field-recording schedule, including the time limitations and the ambient sounds that inevitably crept onto the songs. Some artists were determined right off the bat. Henry calls Lead Belly “the patron saint for us on this trip.” After the Mermaid Avenue records, Woody Guthrie was an obvious choice for Bragg. Hank Williams certainly belonged. Other songs came up on the journey, like “Gentle On My Mind,” the John Hartford classic that became a big hit for Glen Campbell. Apart from the train whistle at the very top of the record, meant to spark the listener’s imagination, everything is recorded as it was, slamming doors, whistling birds and train announcements included. And, crucially, everything was done on Amtrak’s schedule. Train stations have long been the realms of buskers, with performers struggling just to get a moment’s notice from an indifferent public hurrying to work. In that sense, those momentary roles Bragg and Henry took on while playing were normal instead of being an intrusion or distraction. The duo looked to record in waiting rooms, most of which are pre-World War II, with tiled walls and brilliant acoustics. Sometimes though, the station was too far away from the train to take the chance. In St. Louis, they recorded outside, right next to the train. Often, the place and the song formed the perfect match. In San Antonio, the expedition paused for the night, taking rooms at the historic Gunter Hotel, where Robert Johnson had his first recording session. Bragg himself slept in that same room, 414. Before departing the next morning, they recorded Jimmie Rodgers’ “Waiting for a Train,” learning weeks later that Rodgers also lived for a time at the Gunter Hotel. Arriving unexpectedly ahead of schedule in Los Angeles—at 4:30 a.m.—they recorded Gordon Lightfoot’s “Early Morning Rain,” a tune about homesickness written in the era when airplanes began overtaking the railroads. Singing on a covered walkway outside Union Station, their first take woke up the birds. Closing the record with a reminder that life is always evolving felt appropriate. While the songs reach into the past, one point Bragg wanted to convey is that railroads are about more than just nostalgia. For Henry, that’s true about railroads and also the songs themselves. “Some songs, like ‘Midnight Special,’ people will relate that directly to Lead Belly. On the other hand, what I love about these songs is we all know different versions and sometimes there’s nothing definitive. It’s raw vocabulary and how you choose to take it up and what you say with it is what matters,” he says. For more from Billy Bragg, check out his performance from SXSW 2013 in the player below.